In this brand-new BBC adaptation of the 2010 Andrea Levy novel by the same name: The Long Song was shortlisted for the Man Booker Prize in the same year and won the 2011 Walter Scott Prize. 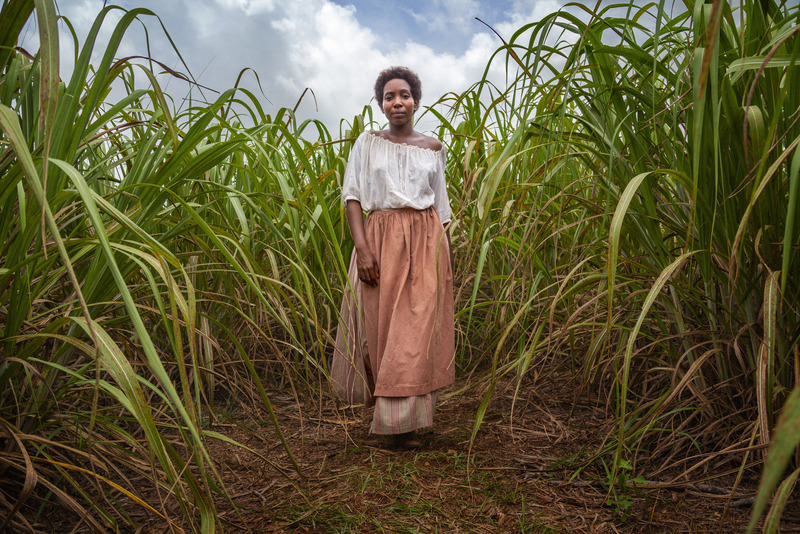 The adaptation takes us to 19th Century Jamaica, (shot in The Dominican Republic) this period drama is a story about slavery lead by the indignant strong-minded slave and lovable July played by Tamara Lawrance. Taken from her mother at an early to live in the “big house” with her chaotic slave-owning mistress Caroline Mortimer played by Hayley Atwell. The story: Set during the final days of slavery in 19th century Jamaica, the story follows young slave July (Lawrance) on a plantation owned by her odious mistress Caroline Mortimer (Atwell). When a charming new arrival to the island, Robert Goodwin (Lowden), becomes the new overseer, July and Caroline are both intrigued by his seemingly revolutionary determination to improve the plantation for the slaves and mistress alike. Alt A was lucky enough see the first episode at a preview screening this week with some of the key cast, Tamara Lawrance (July), and Hayley Atwell (Caroline) and Sir Lenny Henry (Godfrey) and director Mahalia Belo and writer Sarah Williams. Essential and central to the three-part drama which airs on the 18th of December for 3 consecutive nights is Lawrence who told us. “Andrea gives Caroline and July the ability to change and adapt and the relationships and the dynamics to change, at one point Caroline does awful things and is hysterical in some ways and she over reacts to the wrong things, her sense of reality is totally distorted from what is actually going on around her which is based I think very much on fear. But we do get to see the shift and change and the more human side of her”. 7 years in the making there was reluctance among the industry to perhaps take on another slavery project. It initially started life as a feature on which Williams said she found “challenging” to adapt that “great big book into feature”. Starting out with Film4 who were already in development with 12 Years A Slave, it was not taken up as they may have felt they had their “quota of slavery projects”. But Heyday Productions took it on. Sir Lenny Henry commented on why it is an important story and how he was got on board. Director Belo said on directing The Long Song. “Andrea’s novel was so rich, every page had a brilliant image, for me it is about centering the project with the inner world of July and when I say July I mean the old July as well (Dona Croll plays the older July telling that story she remembers) the young person she was in the moment so a lot of the language we used was to try and see the world from July’s eyes so she is the queen in the middle of it all. And she has these moments of beauty and she has real experiences and I like, there is a moment in the novel where she felt she was flying with Nimrod (her male love interest) and I thought you know let’s make her fly, let’s give her that moment, it is what it means to be human to have an imagination and give her that dignity as well”. Williams who wanted to keep the adaptation as “true to the book as possible” said. “It is a very important book and my note to myself was don’t muck it up, to me it was a golden opportunity if you are a writer be handed a book like this and I felt my job was to be as invisible as possible because the book really speaks for itself. It just not just a book about slavery is a book about the human condition”. The cast includes Doña Croll as Old July, Sharon Duncan Brewster as Kitty, Ayesha Antoine as Molly, Arinzé Kene as Thomas, Ansu Kabia as James Richards, Jordan Bolger as Nimrod, Joy Richardson as Miss Rose, Madeleine Mantock as Miss Clara and Leo Bill as John Howarth. The Long Song airs on BBC One on Tuesday, December 18, Wednesday 19th December and Thursday 20th December at 9pm. If you like this or anything else on our website please share or follow us on social media. It helps us to spread the word about creative diversity and the talent.